The YZS-120 oil pressing machinery is an advanced oil press machine, the structure is simple, the operation is easy and convenient, wide suitability and continuous operation, high productivity and high oil output rate. What's more, this type of oil pressing machinery is suitable for cold pressing or hot pressing any oil seeds and oil plant, such as palm fruit, palm kernel, coconut, peanut, cashew, avocado, tiger nut, rapeseeds, peanut, sesameseeds, etc. It was widely used in the small oil pressing line and rural enterprise. The picture shows the inside part of the feeder for our YZS-120 oil pressing machinery. It is not just simple reversed fastigiated container to let the materials let down itself, but with a screw device and a stirring rod in the middle of the machine. When you turn on the oil press, put the materials in the feeder, the screw device will turn round to help feed the materials to go down to the chamber of the oil press smoothly and effectively. 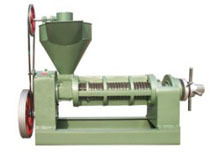 With this device, it avoids the blocking in the feed inlet of the feeder, improve the effect of the machine highly, and the stirring rod also have certain effect on mixing the materials before pressing oil. Anytime you are interested in any of our oil pressing machinery, please fell free to contact us in the following form. We are always at your service!